(Reuters) - The IOC's Coordination Commission has praised Tokyo's early preparations for the 2020 Summer Olympics, highlighting the financial planning and diversity of local organisers after a three-day visit to the Japanese capital. 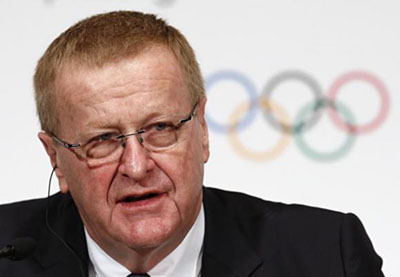 Commission chairman John Coates headed the visit, which was the first working-level talks between the Tokyo organising committee and the IOC's coordination body. "We're very, very impressed and very pleased with the progress to date, and look forward to working with Tokyo 2020 in what, so far as I'm concerned, is a partnership," Kyodo news quoted Coates as telling reporters in Tokyo on Friday. He described as "realistic and achievable" the earmarked revenue streams that will be needed to cover the estimated $3.4 billion Games budget. Coates and other IOC officials toured existing venues and were taken to sites that have been marked out for new venue construction. "At this stage I don't see any challenges - what I see is opportunities in terms of the legacies that can be left in encouraging more Japanese to participate in sport," Coates said. The coordination commission will assist Tokyo as it builds towards the 2020 Games, serving as a link between the IOC and the local organising committee. Coates also commented on local organisers appointing 10 women to the 34 member executive board and called for more work to be done to bring more diversity in Olympic preparations. Coates added that while discussions did not include the possibility of baseball and softball being brought back to the Olympic programme for the Tokyo Olympics, he said the issue was "on the table" and a decision should be made by the IOC's extraordinary session in December.